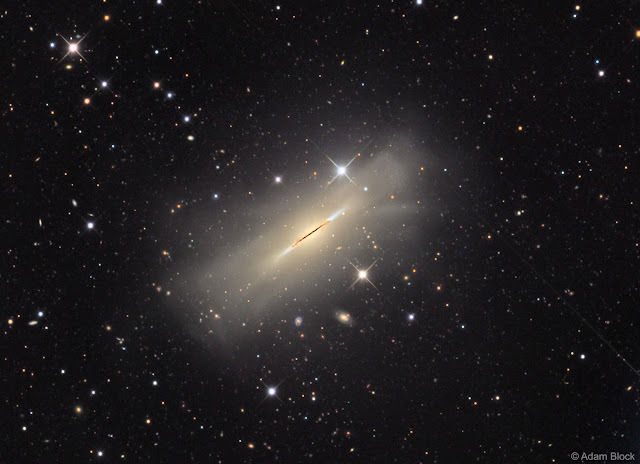 The Spindle Galaxy lies about 50 million light years away, near the constellation Draco. Because we're seeing it from the side, we miss all of the typical galactic detail and see only a line of dust and some bright blue young stars. But I love that even though the real beauties of this galaxy are reserved for those with better seats, that halo of light surrounding it is still worth looking at, and bright enough to earn it spot number 102 in Messier's catalog.